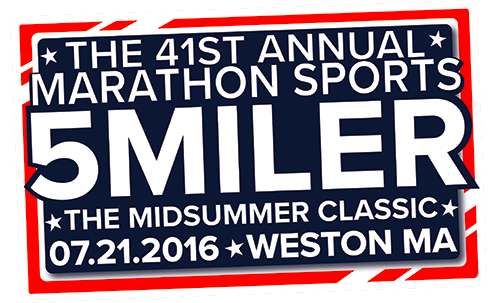 A long-time fixture on the summer road racing circuit, the 2016 Marathon Sports 5 Miler will have to be canceled due to unforeseen construction and community improvement projects in the town of Weston. We are terribly disappointed to have to cancel what has become a great midsummer tradition and an event through which we have donated to the Leukemia & Lymphoma Society for many years. We will be back and better than ever next summer, and hope to see you there with us! Please see below for the answers to any questions you may have, or email us at mail@marathonsports.com with any additional questions or concerns. Why was the race cancelled? Due to unforeseen construction and community improvement projects in the Town of Weston, we will not be able to hold a safe race for all competitors. Will the race be rescheduled? The race will not be rescheduled to another date for 2016; however, the race will continue on in 2017. Will the race return in 2017? What happens to my race registration fee now that there will not be a race? Donate the registration fee in full to the Leukemia and Lymphoma Society. If you would like to choose this option, you do not need to take any action as your registration fee will automatically be added to the final donation to the Leukemia and Lymphoma Society. You can receive a comped entry to the 2017 Marathon Sports 5 Miler. In order for you to take this option and receive your comped entry, you must email mail@marathonsports.com by end of day on July 21st letting us know. Your name will be added to the list and you will receive a notification as soon as the 2017 registration opens. You can receive a full refund for the race registration fee. In order for you to take this option, you must email mail@marathonsports.com by end of day on July 21st letting us know. Everyone who opts to receive a refund will be issued the refund on July 22nd. The refund may take a few business days to process. Will I receive the processing fee back as well if I opt for the refund? Unfortunately, that is a fee charged by Racewire for the use of their registration platform and not something we have the ability to refund. Can I still donate to the Leukemia and Lymphoma Society? Can I still get my t-shirt? In an effort to try and raise as much money for the Leukemia and Lymphoma Society in 2016, despite not holding the race, we will not be printing the 2016 race shirts. This question only applies if you would like to select Option #3 from above: I paid via cash or check, how do I receive my refund? All checks will be voided and shredded. If you are concerned beyond that, please make sure to have your bank void the check. If you paid cash, please reach out directly to mail@marathonsports.com so we may arrange to get you a refund in the same form of payment. In consideration of the acceptance of this entry, I do hereby for myself, heirs, executors, administrators wave and release any and all right and claim for damages I may have against the Town of Weston, Marathon Sports, and all sponsors by my registration in this event.